When I was younger I was a baseball fanatic. Ken Griffey Jr. posters adorned my bedroom walls and every summer consisted of a run down the driveway to see the sports page and look for the latest home run count. I am either extremely lucky or unlucky to have grown up during the height of the steroid era of baseball. Thankfully, my favorite player was never implicated in any of the investigations. Unfortunately, the second half of his career was marred by injuries and he never set the all-time record for home runs. The moral of this story is that since his retirement I have had little reason to pay attention to baseball. I chose not to purchase MLB 12: The Show because there were enough changes going on next season that I figured I would save my $60 for that. Now that we are one day from the World Series and two teams I don’t follow are playing for the title; it’s time to start looking at next year. Extra Wild-Card Game For Playoffs – This year we saw an addition to baseball that was a long time coming. The addition of an extra playoff series (even if it was only one game) that allowed for another reason to hope for the unlikely to happen with a second wild-card slot. 162 games in a season can often prove to be a marathon that most people stop paying attention to in the months of June and July. This year we saw the likes of the Indians and the Pirates have hopes of the playoffs dashed in the middle/late-middle of the season. The fact that they still had some hope was largely due to the extra playoff spot. In MLB 13 we should hold this as a sign that playing a full season of 162 games might not be a complete waste if you can squeak into the playoffs with an underdog team. Look out for my Tribe next season as we will be making a push with a new manager and hopefully a few new players. Houston Moves To American League – One reason it was easy to pass up on MLB 12 was due to the fact that the move of Houston to the American League was announced. It takes away from a Franchise Mode when you know that after the first season you will not be able to realistically move a team to another league. This is minor from most perspectives, but it does take away from the immersion if you are in a sports game for the long-term. Even if it is one of the worst teams in all of professional sports. Harper, Cespedes and Trout – These three players are bringing me back to baseball. It has been a long time since baseball has had a face to bring people to the sports page every day. Bryce Harper is arrogant, sure… but he is one hell of a ball player and his talent is finally more than just some sort of YouTube homerun derby video. Yoenis Cespedes almost saved my fantasy baseball team this year and let’s face it – he plays on Billy Beane’s Oakland A’s. I love the opportunity to watch teams like Oakland play moneyball and develop talent however they can. Mike Trout almost gave me faith that a rookie could win the MVP award and deserve it just because he is a solid player all-around… rather than some sort of brutish homerun king that can’t play defense. Next year could be the year that Trout really jumps to the fore-front as a true MVP contender. Spring Time – Face it, baseball starts during the springtime. It is one of the few signs that the weather is about to get better after a long winter. I am already dreading the arduous drive to work every day during January and February. Opening day in baseball is unlike that of any other sport. When we see MLB 13 on the shelves it should give us hope that the snow is about to melt and we can get back to enjoying the weather outside… not to mention some of America’s past time. Faith In Sports Gaming Renewed – Every August we are blessed/cursed with EA Football games. America’s favorite sport is largely football. 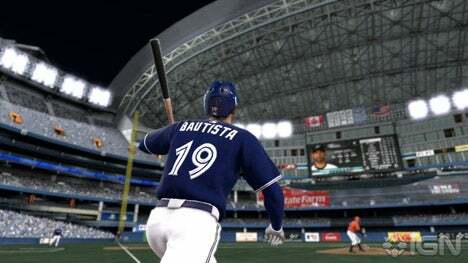 However, when it comes to sports games – MLB: The Show and NBA 2K are the best ones out there. After the NFL season has come to an end we are often left with that pit in our stomach that there is no more football to watch. However, when we get that first smell of baseball it is hard to let it go. The smell of the leather with a baseball glove over your face, the sound of a hanging curve getting smashed into the bleachers and the feel of freshly mowed grass under your cleats should be enough to make you forget about football… at least until the draft.